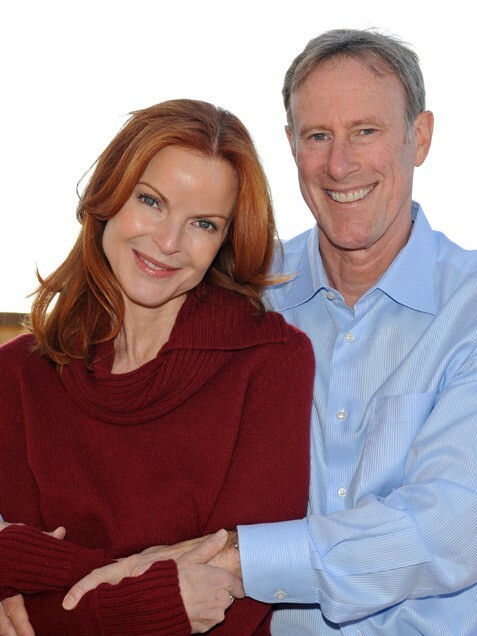 Desperate Housewives star Marcia Cross, 49, became anything but when she married stockbroker Tom Mahoney, 53, in 2006 -- a first marriage for both (pictured at a Newport Beach, Calif., resort on Dec. 31, 2010) at the ages of 44 and 48, respectively. The pair, who met in a flower shop, welcomed twin girls a year later. Marcia told People.com she knew Tom was “a keeper” when he stayed in bed with her playing word games to take her mind the Emmy nominations that morning (fortunately, she snagged one) and gushed that Tom is her "favorite beauty product." She said, "I think that beauty comes from being happy and connected to the people we love, and his love makes me feel beautiful."